More Than We Seem... where it all started. 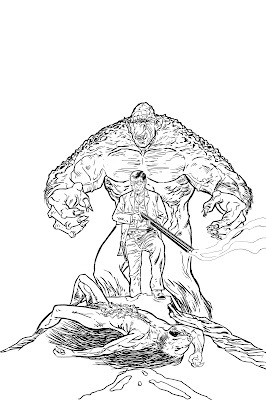 John Freeman over on Down The Tubes has been going through small press/independent comics of the Mid 1990s and name checks my first go at producing a comic book, called More Than We Seem, which I co-created with writer Larry Betts. 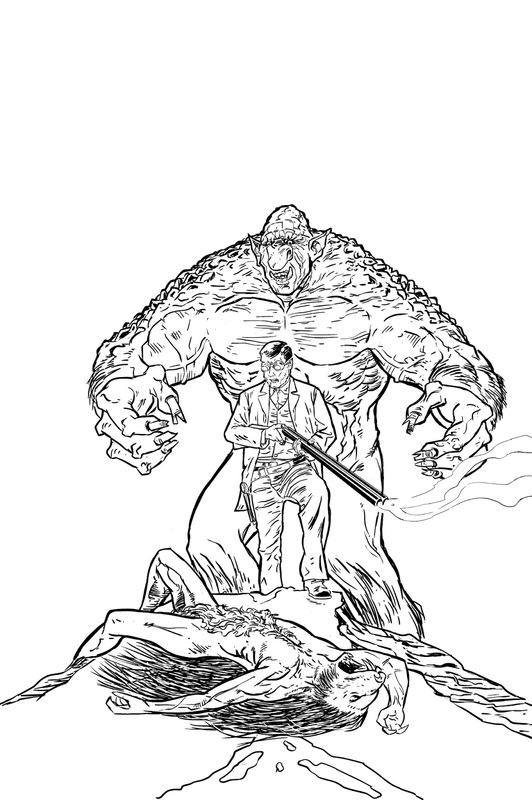 It was an opportunity to learn the whole 'making your own comic' process and business, but wasn't something that I could keep going and so ended around issue 6. Great fun while it lasted though and nice of John to remember it. 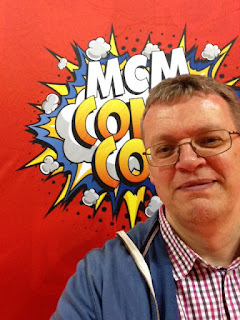 As much as we enjoy the spectacle that is that MCM event, it is nice to go to an out and out comic show now and then. 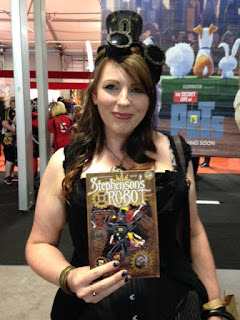 the Glasgow Comic Con has been going a good number of years now and we've had a table at the last three (I think). Again, this show seems to suffer from the fact that there are just so many shows these days and sales seem to reduce a little year on year. That said, it's always been a pretty good show for us so we'd hate to miss it. A long drive up where Colin and I typically discuss Accent UK's 'Next 5 year' plan which just as typically fails to survive the year we agree it. Finding the venue and hotel were much simpler than in recent years and the venue has moved to a concert hall about 3 minutes walk from the hotel we usually book. We were set up pretty sharpish on Saturday morning and looking forward to a good two days. There would certainly be no logistical reasons for poor attendance at this show as it was pretty much in the heart of the city. And so it proved to be really. Plenty of people found their way into the event and they were pretty much all looking for independent comics. Sure there was Cosplay and there were people looking for the latest copy of XMen but in the main the people stopping at tables were genuinely interested in who we were and what we were doing. 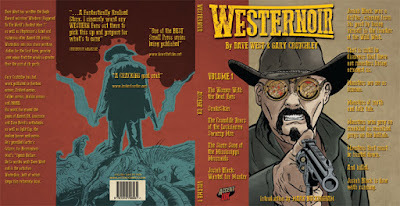 First off we have a review of Tales Of WesterNoir 2 over at DownTheTubes, and also a WesterNoir 6 review over at WritingCobblers.blogspot.co.uk. Lisburn MCM - The New Venue. We'd been to the Belfast MCM event since it started, which is two years now, and we booked this without realizing that it was no longer in the outskirts of Belfast but actually had moved to the sight of the old Maze Prison in Lisburn. The new Eikon centre. OK, so this was a risk. 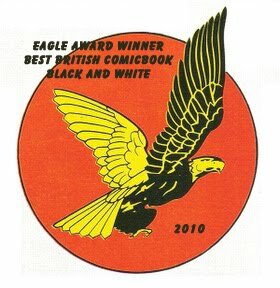 Would people travel all the way to Lisburn to buy comics and take part in an event that was clustered with a number of others in the local area ? We'd not been confronted with the old 'How many comics can we take within the luggage allowance; for a long time and the last time there had been three in the group, this time it was just me and Colin. We did the best we could and at the airport both suitcases came in just below the weight allowance. All good so far then. Colin, as always, had planned how we'd get to the venue and we'd decided to go straight there on the Friday, offload our stock and then walk to the hotel and check in. On paper it was only a 3 mile walk, and with the bags being comic free it didn't look too much of a problem. Plane from Manchester to Belfast. Bus from airport to Belfast City Centre. Train from Belfast City Centre to Lisburn Station. Taxi from the train station to the venue. All seemed straight forward enough. And it was, until we reached Lisburn Station, which had no eager rank of Taxis waiting to ferry us on our way. Not a big thing and something I had thought might be the case. So, dragging our suitcases (good job they come with wheels these days) we set off looking for a taxi service. We passed one that had closed down but eventually found one, and the 40 minute wait was spend in the pub next door, where we chatted to some very friendly locals, once we clarified that we were not in fact 'comics' but a couple of blokes who made 'comic books', it's a recurring problem and I've no idea why people look at me and think 'comedian'. phone number when I noticed the handy pub next door. The taxi took us to the venue, which we discovered was the sight of the old Maze prison and we also discovered that the venue, as nice as it was, was sat on its own in the middle of a large expanse of waste land. With no trains, bus stops or helipads (for special visitors). Still, we decided that we were here now and might as well make the most of it. We also noted on the way in that the local roads were very narrow, surrounded on either side by hedges and no footpaths. We would have to get a taxi to and from the venue every day. Saturday then saw us set up nice and early and wonder if anybody would find the venue, let alone find us. Our friendly neighbourhood organizer told us about the shuttle buses that had been laid on from Lisburn Station and also the reasons for the choice of venue, which all made some kind of sense. And then the doors opened and people came in. Yes, people had managed to find the event. It started to get fairly busy. Not London or Manchester busy, but there were enough people there to give it the usual MCM atmosphere. and we started to get people at the table interested in what we had and some who'd bought stuff from us last year and wanted more. and her little top hat was wonderful. We had a decent Saturday and agreed that if we did as well on Sunday (which was possible) then we'd have done OK. Even Beauty and the Beast turned up. We agreed to share a taxi back to the hotel with Gary Erskine and also walked down into the village to meet up with Jenika Iofredda and Moonboy (as we call him) and find someplace to eat. All of this was set against a backdrop of the Brexit vote and Ireland playing in the quarter finals of some European football championship. Let's just say it was lively. A really enjoyable meal where we were later joined by one of Gary's Cosplayer friends in a very safe atmosphere (I think the pub full of English fans watching the team lose would have been a little more... worrying), made for a great night. The walk back up the hill to the hotel clearing our heads a little. Sunday was slower than Saturday but we did manage to sell about the same number of books in the end and so overall the Con was good enough for us to revisit next year. The venue was a little far out but it turned out that made it easier to get to by car. The shuttlebus were constantly moving people to and from the event and I think overall pretty successful. The attendance felt about right. We had a very enjoyable time and met some really nice people. I've not posted for a while, but that doesn't mean that I've been sat on a beach somewhere getting brown... or red. 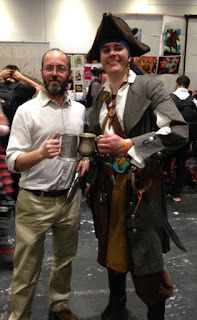 It's a pretty hectic time at the moment with Comic Cons taking up more weekends than is typical, which means cramming everything else into the remaining days, and that's resulted in my finding no time at all to sit and write up the usual Con reports. The last weekend in May then saw Accent UK, in the shape of Colin, Jemma and me once again getting lost driving around the Excel Centre trying to reach the venue. We do this event twice a year and every time we seem to get lost at roughly the same place. Anyway, we were fortunate that they'd extended the set up time on Thursday night and so when we wandered in on Friday morning for the first day of the event, we were pretty much all set up. 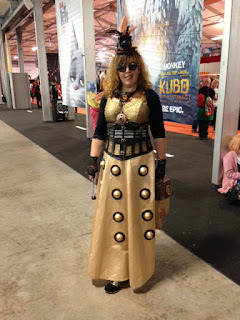 Friday at the London MCM is becoming as busy as Sunday and the first day looked to support that trend. 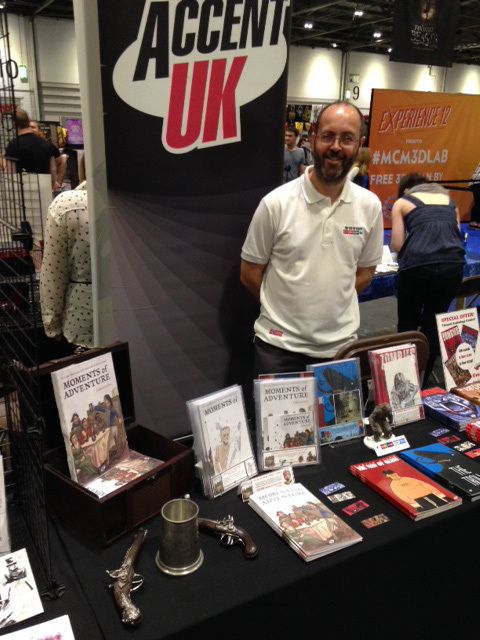 We did OK. We met a load of people and sold a good number of books but also had time to wander around and visit friends, Steve Tanner had his great new book Flintlock in pride of place and having read it myself now I must say it sets the scene very nicely for follow up issues. 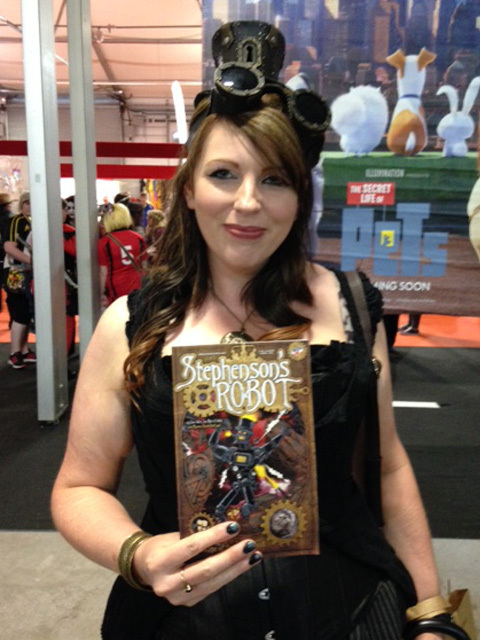 It even has a robot .. errr ... sorry .. Clockwork Man in it, which will always get my vote. You couldn't move for the number of amazingly costumed characters parading around. 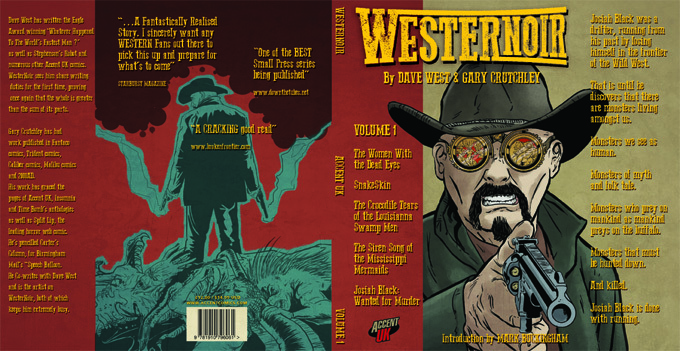 As I talked to customers about our Western and Steampunk books, both set in Victorian times it struck me that to people of that time this whole event would look otherworldly, what would they have made of it all. We had a great day on Saturday and spent most of it behind the table. Jemma took time out to go back the the apartment we'd booked so she could revise for her A-levels but the rest of us were pretty busy all day. Scott was on hand to help too, he'd come down by train (not saying anything about Colin's driving of course .. he had another reason for doing so .. or so he said). Sunday was pretty much as expected. Quieter and we sold about the same number of books as we did on Friday. 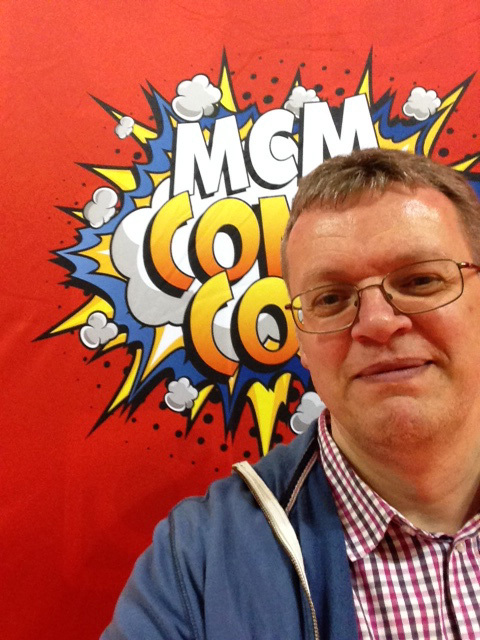 The London MCM then is like a finely oiled machine, it is all very well organised, has a massive attendance and is just 'established'. A long drive home on Sunday night after three days Comic Conning and the car was full of chat about the event, the future for Accent UK and fewer boxes of Accent UK stock. We always have a running joke that if we don;t sell enough books then there won;t be enough room for those who came down by train. We have yet to have anybody have to take that lonely journey up north.